I received a sweet surprise in the mailbox today in the form of my ZPacks Zero backpack! (And yes, it was inside the mailbox). I had ordered this pack a little over 4 weeks ago along with some other smaller items and have waited patiently for it… And now that I actually have it in my hands, well, I have got to say that it was worth the wait! The use of cuben fiber for applications such as a backpack can be a hairy subject, but I have read enough good reviews and even have experience with cuben fiber first hand, so this is not such a big deal for me. I currently have 3 main backpacks. Each one fits a different need, and in my opinion, this is more ideal than trying to make a single pack work for all occasions. I have my ULA Circuit which I use for cold weather trips in which my son (or wife) go along with me. The Circuit allows me to carry more gear comfortably. I use my ZPacks (cuben fiber) Blast 30 backpack for cold weather “solo” trips (such as when I go with friends and am not sharing any weight). And now, I have my ZPacks Zero pack to use for my warm weather solo trips! So, when I was looking for a new lower volume pack to carry my smaller volume/lighter weight summer gear in, of course ZPacks was the main contender! I emailed Joe and asked him lots of questions and once I settled on what I wanted, I just needed to save a little money to place the order. Also, I need to give thanks to John Abela here. Thanks to him, I was able to actually try out the Zero pack in a size XSmall, which allowed me to realize that I would probably be happier with a size Small rather than the XSmall. So, when I ordered the pack I decided to stay with the 1.43 oz/sqyd cuben fiber since the next step down was to go with the 1 oz/sqyd. I had debated going with the 1.26 oz/sqyd but it was not available anymore. When I had last talked to Joe he told me that at that time he might have had enough 1.26 oz/sqyd left to do 1 more pack, but by the time I ordered, I just decided to stick with the 1.43 oz/sqyd for the simple fact that the 1.43 oz/sqyd was more durable. The only other thing that I wanted on this pack was some loops on the back of the pack to allow me to stretch a piece of shock cord between them and use them as an outer pad holder. Joe offers some triangular-shaped pad holders as an option, but they are heavier. With the loops, I can use them when I want or remove them if I want (although the triangular pad holders are also removable), not to mention the straps are “much” lighter! As I said in the beginning of this post, the pack arrived today in a mailing envelope that easily fit inside my mailbox. (No mail-lady knocking on my door with package in hand this time!) Then, to make things even cooler, when I opened the envelope, my pack was then inside a 1-gallon Ziploc bag, and there was even room left over inside the Ziploc with the pack. So, when I ordered the pack, I expected the pack (3.1 oz), the center pocket (0.7 oz) and the pad holder loops (estimated 0.2 oz) to weigh a total of 4 oz. And low-and-behold, once I set the pack on my scales earlier today (before even unfolding the pack) the total weight came to exactly 4 oz (114 gm)! So, that was a good guess on my part, but an even better workmanship on Joe’s part! This just shows how well Joe manages his business and pays attention to the gear that he creates. Thanks Joe! So, in this video I used about 99% of the gear that I am putting together to create my near “SUL” (Super-UltraLight) gear list. Although, there were a few things that I did not include in the pack such as the actual Esbit tablets, my phone and my water. Other than this though, everything in the video is pretty much everything that will go in the pack. However, I do plan to use the Multipack in conjunction with the Zero pack. In the Multipack will be my Ditty Bag (the contents of the Ditty bag can be seen by clicking on the link directly above, along with everything else on the gear list), my Cloudkilt, camera, map and notebook. This pack does not include neither a hip belt nor a sternum strap. If I feel like I need either of those I can steal the sternum strap from my Blast 30 pack and I feel like I can fashion some sort of hip belt quite easily enough. I do not feel like I will need a hip belt as far as weight transfer is concerned with this pack, but I may possibly need it to help stabilize the pack while hiking. I will have to take it out for a few hikes to be able to truly determine this though. So, anyway, I just wanted to share a little bit about my new Zero backpack. Obviously I do not have any on trail experience with it (I just opened it on camera a few hours ago) but I will get some in soon enough. So, you can be sure that you will be seeing more of this pack throughout more of my post’s for a while! Until then, thanks Joe for the awesome gear, and thank YOU for taking the time out to read/view this post! If you have any comments or questions, please feel free to post them below. 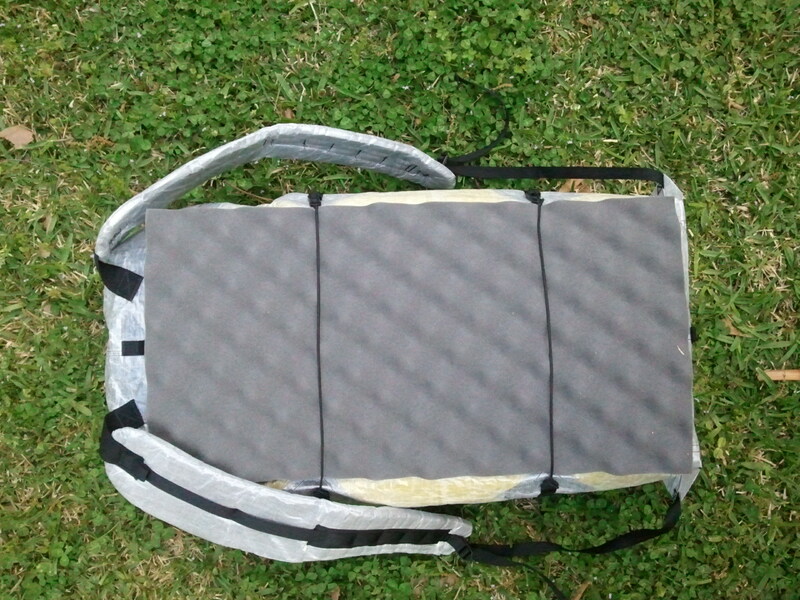 A few months ago, I picked up a cuben fiber ZPacks Zero backpack. The reasoning behind getting this pack was that my “summer” gear had dwindled down so far, the rest of my packs simply swallowed it whole. As well, the weight of my “summer” gear had also lessened quite a bit, so here again, my other packs were actually overkill. So, I decided to update my pack situation and to go with a smaller, and even more minimalist’s type backpack. As seen in my unboxing video of the ZPacks Zero backpack, I went with the size small (1,500 cu in) and the only additions were the front mesh pocket (+ 500 cu in) and a few loops so that I could attach a sleeping pad to the outside of the pack with cord. The pack weighed exactly 4 oz out-of-the-box. When ordering this pack, there were a few things which I considered, but then intentionally left off. One being a sternum strap and the other being a hip belt. With the sternum strap, I figured that I could simply “borrow” the one off of my Blast 30 backpack if I wanted it. Ans far as the hip belt is concerned, I just figured that I planned on carrying so little in this pack that I could simply get away without actually using one. As well, there were some other things that I had intentions of actually adding onto the pack when I ordered it. Obviously, I planned on adding 2 pieces of shock cord (with mitten hooks) to the loops which hold a sleeping pad in place. I attached them to one side by simply looping them through one set of the loops. Then, after placing the sleeping pad on the back of the pack, I can simply stretch the shock cord to the other side and use the mitten hooks to attach them to the opposite set of loops. The 2 pieces of shock cord and the mitten hooks added an additional 0.1 oz to the total pack weight. So, this brought the total weight of the pack to 4.1 oz. The top portions of the water bottle holders are made from various pieces of small diameter left over cord I happen to have lying around and mitten hooks. The bottom pieces are simply pieces of shock cord, fed through the daisy chain on the shoulder strap and then the ends are tied together. 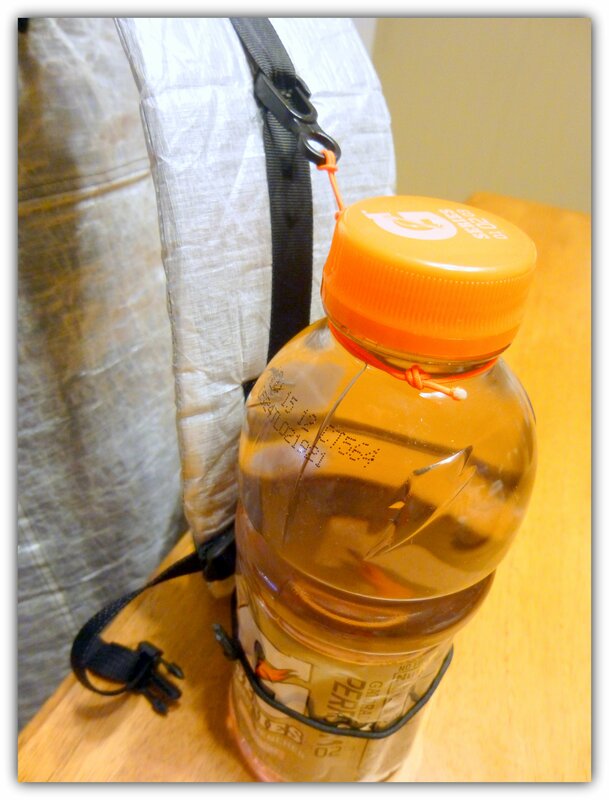 The pair of water bottle holders add an additional 0.1 oz to the total weight. This now puts my total pack weight up to 4.2 oz. So, as I mentioned at the beginning of this post, 2 items that I heavily considered but decided to leave off was the sternum strap and the hip belt. Once I got the pack, I loaded it up and wore it around the house for a while. What I found immediately was that it felt like the shoulder straps were actually sliding off my shoulders just a little. After realizing this, I made a make-shift sternum strap and noticed a huge difference. At this point, I decided that I would order some 1/2″ nylon webbing and some clasps to make my own sternum strap for this pack. The total weight of my DIY sternum strap is 0.2 oz, which now brings the total weight of my pack to 4.4 oz. Long story short, what I ended up doing was attaching a loop of 1/2″ nylon webbing with the receiving end of a 1/2″ buckle to my pack where a hip belt would normally connect. With this in place, I am able to easily attach the hip belt that came with my multipack now to both the multipack or to these newly installed buckles and use as a hip belt on my pack! These 2 buckles are now a permanent part of my pack (unless they break) and add an extra 0.1 oz to the weight of my pack. This now brings the total weight of my pack to 4.5 oz. 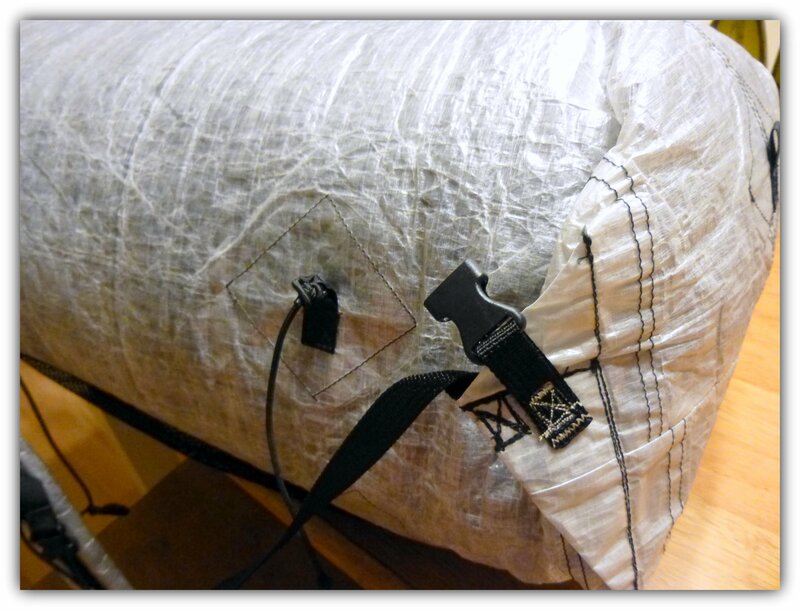 The actual hip belt weighs an additional 0.9 oz, which will then bring the total weight of the pack up to 5.4 oz. Looking back at the additions I have installed on the pack, only one of them is something that I now cannot choose to leave off, which is the hip belt buckle that I sewed in place. I can, however, still choose to leave behind the shock cords which hold the pad in place, the water bottle holders, the sternum strap or the actual hip belt. This means that now my base weight on this pack is 4.1 oz, and I have the option of adding on whichever extra options I choose. And of course, the pack will max out at 5.4 oz. I have used this pack on the last few backpacking trips that I have been on this summer. The weight has ranged from just under 15 lbs to around 8 lbs. I did use the hip belt on each of the trips, however, I only found that I needed to cinch it down about 30 minutes on one trip. This was just after I had refilled all my water and was at the end of a 20+ mile day. Considering this, I will probably opt to leave the belt behind on some trips from here on out, but I love that I simply have the option to choose. To this point, I see now wear on the pack. There is no stitching coming loose, including those that I threw in the pack. I look forward to using this pack for many, many more trips. This will definitely be my go-to pack for solo use during the summer months. Thanks. That helps. For some reason the cuban fiber packs just do not appear as comfortable as other cottage company packs. Wish I could try one out first. Going the GG route would be easy and cheaper. Having options is a good problem to have. Take care! 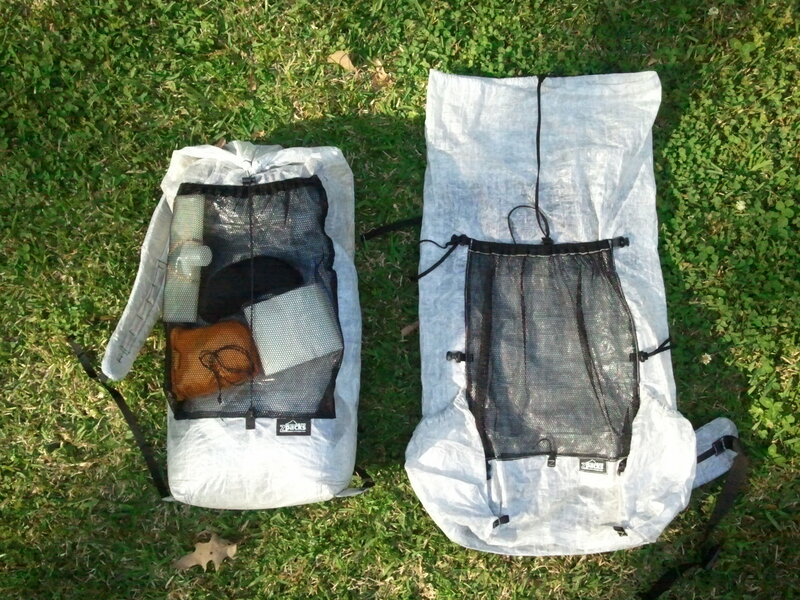 But, IME, 15- 20 lbs and a frameless pack can ride just as well as a framed pack. I personally carried my framless medium Zero for 7 days in the Olympics and started with right at 25 lbs. And with all the rain we had, I imagine my pack never really got below 20 lbs… I was happy with it. 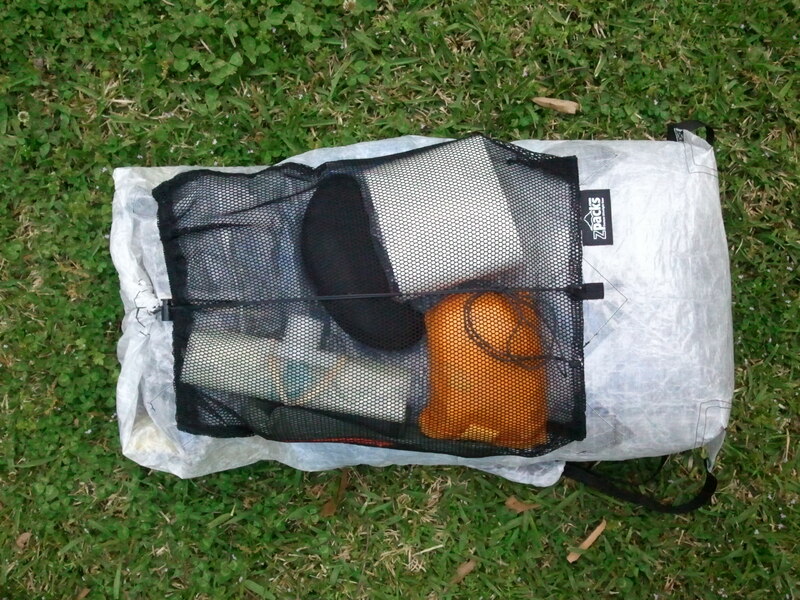 Also, let me add that with a frameless pack, the way it is packed is directly related to how comfortable it will carry. 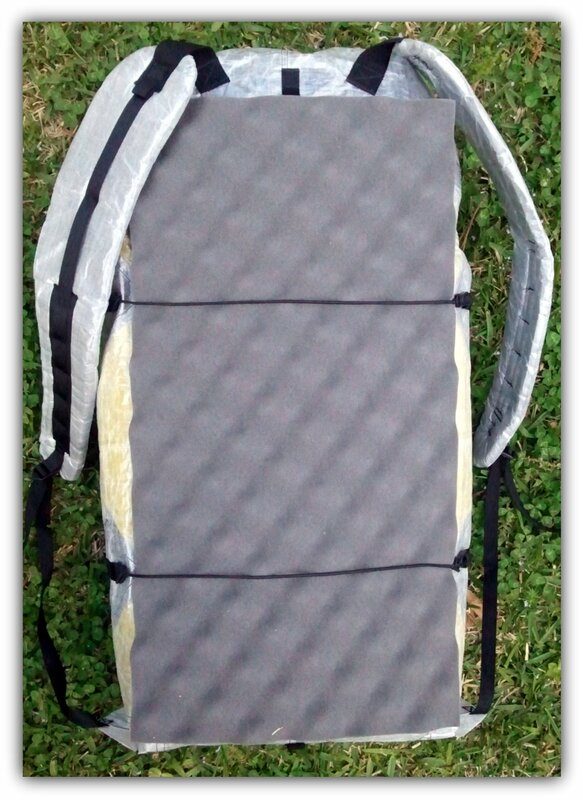 I line the back of mine with a pad (NeoAir usually) that is folded flat, then start filling the pack. I let stuff fluff up inside, and rather than try to cinch down the pack to make the pack fit around the contents, I let the contents fill the pack. This will allow the pack to be completely filled (sometimes), and IME, this is the most comfortable way to carry a pack, filled, not mushed down. Also, I tend to rather heavier items to be towards the top of the pack, never lower than the middle of the pack. Anyway, hope this helps some!